On the Dashboard you can choose between creating, uploading, authoring, publishing & sharing your spatial data and collecting, inspecting and managing field data. 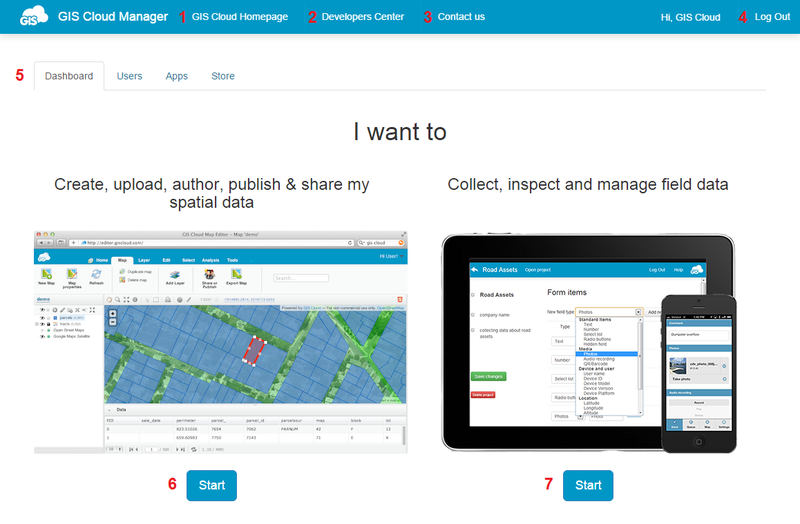 GIS Cloud Homepage – link to the GIS Cloud front page. Developers Center – link to the Developers API guide. Contact us – let us know if you have any questions regarding our apps, we are happy to hear your feedback. Users: create and manage your organization and assign licenses. Apps: create and manage your custom apps. Store: subcribe and unsubscribe from GIS Cloud. or Mobile Data Collection applications.